Global conflict and the mobilisation of troops during the Second World War brought couples together who would never have met in that era. Although marriage was discouraged by the military, tens of thousands of locals married foreign nationals on active duty. Couples met on the dance floor, on air bases, blind dates, in queues, hospitals or air raid shelters. For war brides, a new husband meant a new country. Artist Bev Tosh is the daughter of a Royal New Zealand Air Force pilot and his Canadian war bride. 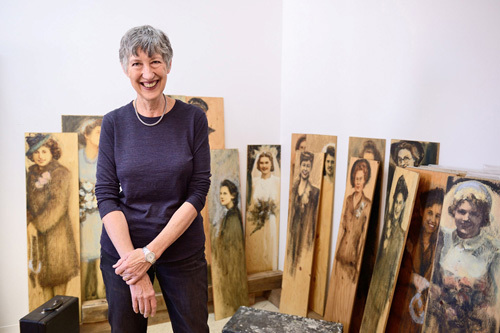 Her works portray war brides of airmen stationed on Royal Air Force bases in the UK during the Second World War and Canadian brides of ‘flyboys’ from England, Australia and New Zealand trained in Canada. Bev Tosh would like to thank the Alberta Foundation for the Arts for kindly supporting her project. Please note that our War Brides exhibition will be closed to the public on Friday 8 February and on Friday 15 February for private viewings. We would like to apologise in advance for any inconvenience that this may cause our visitors.